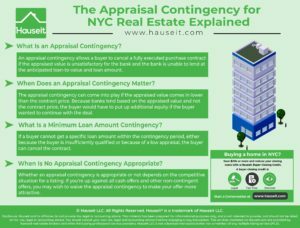 What is the appraisal contingency in real estate contracts in NYC? Is the appraisal contingency standard and included within the financing contingency? We’ll explain everything you need to know about the appraisal contingency, go over common negotiating points and show you sample contract language in this article. When Does an Appraisal Contingency Matter? What Is a Minimum Loan Amount Contingency? When Is No Appraisal Contingency Appropriate? 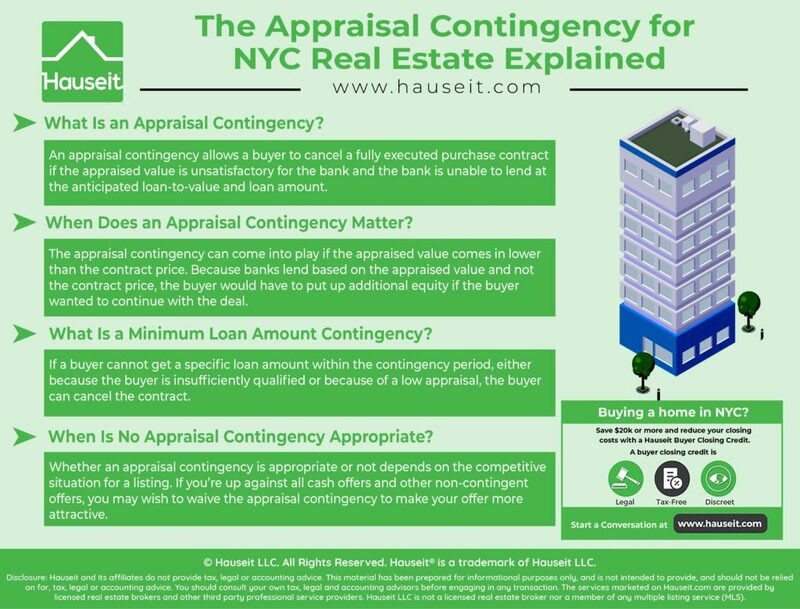 An appraisal contingency allows a buyer to cancel a fully executed purchase contract if the appraised value is unsatisfactory for the bank and the bank is unable to lend at the anticipated loan-to-value and loan amount. Is the Appraisal Contingency Standard? Contrary to popular belief, there is appraisal contingency language built into the mortgage or financing contingency sections of the New York Bar Association condo and coop contracts of sale. Please keep in mind that in NYC, real estate attorneys representing buyers and sellers will typically negotiate a standard purchase contract with “riders” of additional negotiating points attached to the main contract. A commitment conditioned on the Institutional Lender’s approval of an appraisal shall not be deemed a “Commitment” hereunder until an appraisal is approved (and if that does not occur before the Commitment Date, Purchaser may cancel unless the Commitment Date is extended). A Loan Commitment Letter is a written offer from an Institutional Lender to make a loan on the Financing Terms at prevailing fixed or adjustable interest rates and on other customary terms generally being offered by Institutional Lenders making cooperative share loans. An offer to make a loan conditional upon obtaining an appraisal satisfactory to the Institutional Lender shall not become a Loan Commitment Letter unless and until such condition is met. The appraisal contingency can come into play if the appraised value comes in lower than the contract price. Because banks lend based on the appraised value and not the contract price, the buyer would have to put up additional equity if the buyer wanted to continue with the deal. 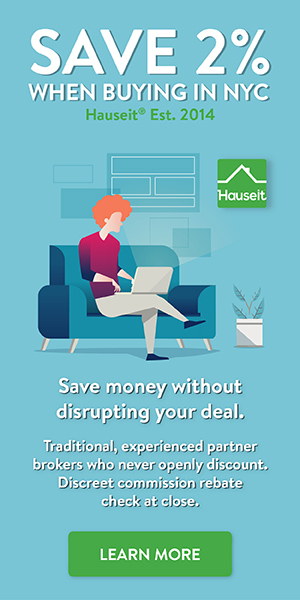 If the buyer doesn’t wish to put up additional equity and the bank is unwilling to increase the loan-to-value to make up for the shortfall, then the buyer can walk away from the deal. Please read our tips on the mortgage loan process in NYC, especially the section on appealing an appraisal, to learn that the appraisal will typically come in at the contract price or above unless the appraiser really thinks that the contract price significantly overvalues the property. As a result, the appraisal contingency can be extremely useful for first time home buyers who are either unrepresented or working with an inexperienced buyer’s agent. 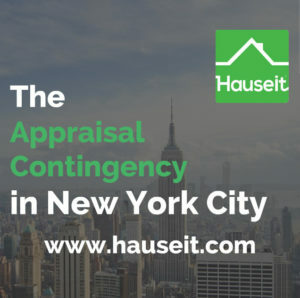 If you have no idea what you’re doing and end up dramatically over paying for a property, an appraisal contingency may indeed save you from a poor purchase. However, keep in mind that an appraisal is not necessarily right, and an appraised value might have little to do with market value. There may be many factors about an unique apartment such as extra high ceilings or fantastic views that an appraiser might not fully appreciate over other factors such as square footage. A minimum loan amount contingency is built into the commonly used New York Bar Association contracts of sale for both co ops and condos. As you’ll see below, the standard co op or condo contract states the loan amount that the buyer will be seeking. As a result, if a buyer cannot get such a loan amount within the contingency period, either because the buyer is insufficiently qualified or because of a low appraisal, the buyer can cancel the contract. The Financing Terms are: a loan of $1,000,000 for a term of 30 years or such lesser amount or shorter term as applied for or acceptable to Purchaser; and the Loan Commitment Date is 45 calendar days after the Delivery Date. The obligation of Purchaser to purchase under this Contract is conditioned upon issuance, on or before 45 days after a fully executed copy of this Contract is given to Purchaser or Purchaser’s attorney (the “Commitment Date”), of a written commitment from an Institutional Lender pursuant to which such Institutional Lender agrees to make a first mortgage loan, other than a VA, FHA or other governmentally insured loan, to Purchaser, at Purchaser’s sole cost and expense, of $1,000,000 for a term of at least 30 years (or such lesser sum or shorter term as Purchaser shall be willing to accept) at the prevailing fixed or adjustable rate of interest and on other customary commitment terms (the “Commitment”). If the mortgage to which this contract is subject is not approved in the amount set forth above but is approved for a lesser amount, the Seller shall have the option to reduce the purchase price by the same amount as the mortgage has been reduced and, thereupon, the Purchaser will accept the mortgage in such reduced amount and will complete the sale at such reduced purchase price. Seller shall make such election to reduce the Purchase Price, within three (3) days of Purchaser’s notice of the low mortgage. If Seller does not elect to reduce the Purchase Price within such three (3) day period then Purchaser shall have the option to cancel and receive the return of the Down Payment in full after which neither party shall have any further right or obligation hereunder. Purchaser agrees to make up any shortfall in the appraised value up to a sum of $25,000. In this example, let’s say the contract price is $1,000,000 and the contract loan amount is $800,000. If the appraisal comes in low at say only $900,000, and the bank refuses to lend more than the original 80% loan-to-value, then the buyer will only be getting a $720,000 loan. That’s an $80,000 shortfall and therefore this clause wouldn’t apply to the buyer, and the buyer would likely be able to cancel the contract. However, in this same example let’s assume that the appraisal came in at $990,000. 80% loan-to-value equates to $792,000 of debt. That’s an $8,000 shortfall which would need to be covered by the buyer with additional equity per the above language. Whether no appraisal contingency is appropriate or not depends on the competitive situation for a listing. If a property is clearly under-priced and receiving a lot of interest, then the seller may hold a best and final offer process. In a bidding war scenario, you’ll want to make your offer as competitive as possible if you actually want to win and buy an apartment in NYC. You may be up against all cash offers and other non-contingent offers. As a result, you may wish to waive the appraisal contingency to make your offer easier to accept. Please consult your lawyer and learn more about waiving the mortgage contingency in NYC before doing so! In contrast, an appraisal contingency is something you might be able to keep in the contract if you’re bidding on a property listing that has a desperate seller, multiple price reductions and over a hundred days on market. In this case, the property is probably overpriced and it may make a lot of sense for you to make sure the appraisal contingency stays in place. After all, it’s not like the seller has another option!